Lexus, the luxury brand from Japanese giant car manufacturer Toyota, is bullish on India despite its late entry into the growing luxury car market. Last weekend, Lexus showcased a brand new hybrid sports utility vehicle (SUV) – NX 300h. It is the smallest Lexus model that will be available in India and the third hybrid model after the RX 450h SUV and the ES 300h sedan. The new NX 300h will see India launch in early 2018, probably around February-March 2018. The expected pricing could be around Rs 60 lakh since the car would be brought in through completely built unit (CBU) route, which attracts between 60-100 per cent import duty and other levies. Lexus entered India in March 2017 with three models - Rx 450h, ES 300h and LX 450d. Lexus India will offer the NX 300h in two variants, which will be Luxury and F-Sport. The F-Sport will be the top-of-the-line trim. The SUV gets a 2.5-litre four-cylinder petrol engine along with an electric motor, which makes a total of 194 bhp of maximum power and 210Nm of torque and comes with all-wheel drive. It will be coupled with an E-CVT transmission. Lexus NX300h runs 18.2 km for every litre of fuel. It comes with a stop and start system, which turns of the engine whenever the car is stationary to save on fuel. The 2018 Lexus NX 300h facelift model was first showcased at the Shanghai Motor Show earlier this year. The new SUV looks stylish and sophisticated with its bold, trapezoidal grille and those sharp LED headlamps. The logo on the grille is set in blue background, which signifies that the model is a hybrid one. The flared wheel arches along with the plastic cladding gives the SUV a butch look. The NX 300h rivals in space the Mercedes-Benz GLC, BMW X3 and Audi Q5. Although Mercedes Benz, BMW and Audi have priced their same segment vehicles lower than the Lexus NX300h, none of the competitors are offering hybrid options in the segment at present. 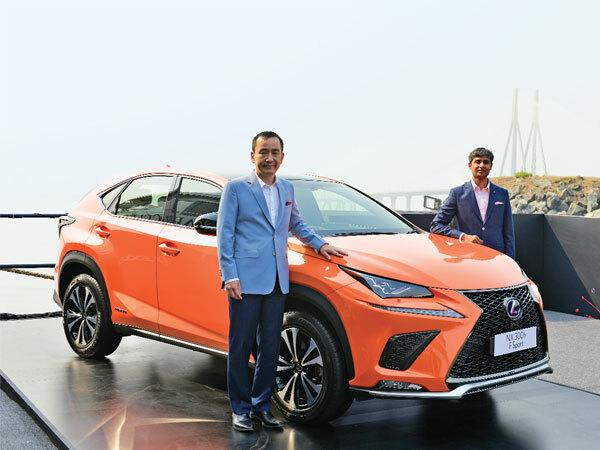 “We are very bullish on the Indian market and within seven months of entering this market we have unveiled our fourth model in the country,” Arun Nair, vice president operations at Lexus India told Financial Chronicle. He said the NX 300h is a lifestyle product and not just a car. “We are looking at announcing the price in January and after importing the cars from the Japanese factory with the 2018 badge, deliveries to our customers will begin between February and March 2018,” Nair said. He said the new NX 300h could cost around Rs 60 lakh but due to currency fluctuation, the correct pricing would be announced closer to the launch in Feb-March 2018. “India is an important market for the Lexus brand and we will introduce more models in India from our exciting product portfolio from time to time,” Nair said. With the growth in volumes, the next stage would be setting up a local assembly in the country to be price competitive in the growing luxury car market, he pointed out. Lexus believes that the NX 300h should be a strong seller with the car being the most affordable Lexus in India. The sharp lines seen on Lexus cars will also be on the Lexus NX300h, which has been built on the L-finesse design language. The headlamp cluster will get LED lights with the iconic L-shaped clearance lamps under it. It will also come with full-size panoramic roof with fixed glass. Inside the car will be a 10.8-inch infotainment system and a wireless charging dock for Qi compatible smartphones. For safety, the Lexus NX 300h will have eight SRS airbags lining the cabin, along with wide-angle cornering lines, EPB, VSC, ABS, traction control, hill start assist, and rear view camera. “The Lexus NX300h brings to life the qualities which set us apart and delivers a lifestyle that is uniquely Lexus,” Akitoshi Takemura, president at Lexus India told Financial Chronicle. This premium urban sports gear delivers exceptional design and comfort and is a fashionable car that suits urban style and use, he added. “The strikingly bold design of the NX 300h is coupled with the performance of a hybrid electric vehicle that makes this a cool SUV,” Takemura said. He said the Lexus models have received positive response and he was confident that the Lexus brand would be well accepted and popular in the country even though it has entered late. He claimed that even those who own a Mercedes or an Audi or a BMW are walking into Lexus showrooms. Since Lexus cars are imported at present those with 3 litre engine attract a 100 per cent import duty and other levies and those below 3 litre engine 60 per cent. At present the company has set up four Lexus showrooms in Delhi, Gurgaon, Mumbai and Bangalore. Bookings have already begun for the new model with a down payment of Rs 5 lakh. Lexus will set up its own network of showrooms and after sales service points as the company parted ways with its parent company Toyota in September this year. Lexus India believes that the restructuring will only help it to establish a strong base in the country.